“We’re going to get it Friday,” said head coach Marc-André Élement without a hint of doubt in his voice. Those were Élement’s first words after his team’s game three loss to McGill. Despite the 6-2 loss, the first thoughts from the Stingers coach were about the upcoming consolation round to decide the third team to represent Ontario University Athletics at the U Sports national tournament. There was no hesitation from the coach in voicing that his team would fight their way into nationals despite not making it to the Queen’s Cup final. At the start of the game, it seemed as if Élement might be giving a very different, yet just as confident, post-game interview. 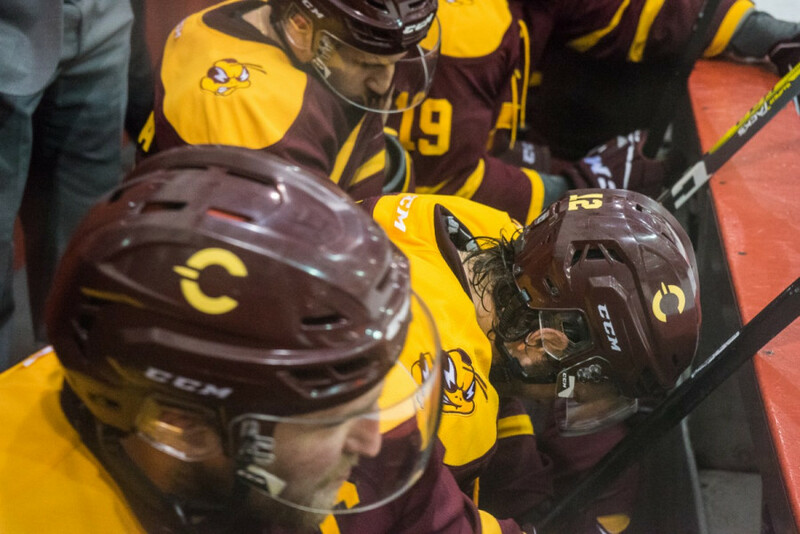 When captain Phil Hudon scored 30 seconds in on the game’s first shot, the Stingers looked to be very much in control of the game. Unfortunately for the Stingers, a few shifts later, Alexis Pepin was kicked out of the game and given a five minute penalty for an illegal hit. “We go and get the first goal on the first shift then two shifts later we get a five minute misconduct. It certainly kills [momentum],” said Hudon. The penalty killed more than just momentum as the Stingers found themselves trailing 2-1 by the end of the major. 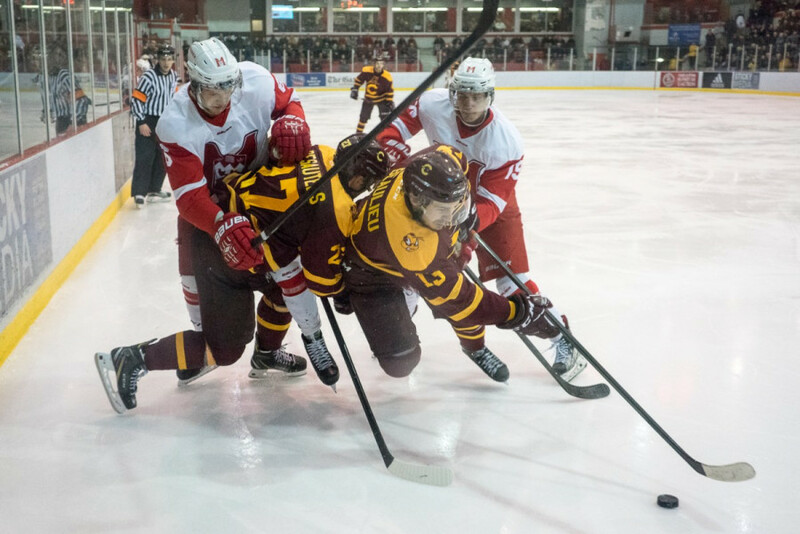 Though they would tie it up, the first period ended 3-2 for McGill while Concordia wouldn’t find the back of the net again. Though both teams played well all series, McGill’s experience and age certainly showed in game three. They looked dominant and in control from the moment they scored their first goal, onward. “It’s just a question of [letting] it sink in, tomorrow’s a new day and then we prepare for a new opponent,” said Hudon who led his team in points throughout the playoffs. Now they look to a Friday night matchup against the York University Lions. The two teams will decide who takes the third and final spot at nationals after McGill and the Brock Badgers. Defender Mathieu Desautels isn’t worried about his team’s confidence going into the game. “We blew our shot tonight so the boys are going to be motivated to get the win Friday. That’s our last shot,” said Desautels. Though they are thinking ahead, both Desautels and his coach did have something to say about McGill going forward. “I just hope we win and get the chance to play these guys again at nationals,” said Élement whose players are determined to earn another crack at McGill moving forward. Even with their loss, the players recognize just how much growth their team has seen over the last season and how much potential there is for the future. Concordia’s best playoff run in over three decades was made by a particularly young group with plenty of room to grow. “We have a special group out there,” said U Sports point leader and second year Stinger Anthony Beauregard. On the Stingers 24-man roster, 14 players, including Beauregard are in their first or second year of a possible five year career. Only four players are in their fourth year and none are in their final year of eligibility. 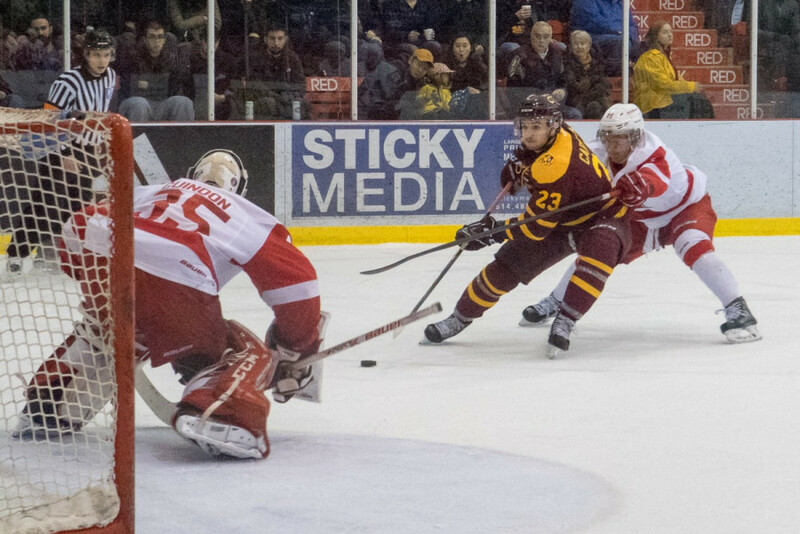 The Stingers swept their first round of the playoffs, got revenge against the Queen’s Gaels for their 2017 playoff elimination and went the distance against the OUA’s top team in McGill, all with a roster that few would describe as experienced. For the team’s captain, that’s one of the most exciting things about this season.